Last February, I wrote a post about an induction cooktop from Gaggenau I'd seen in Germany the previous month. Gaggenau calls it Full Surface Induction and I was completely blown away by it when I saw it for the first time. Full Surface Induction dispensed with the idea of burners all together and turned the entire cooktop surface into a cooking zone. The appliance could sense the size of the pot resting on it and only activated the induction coils beneath that particular pot. I wouldn't have believed it had I not seen it with my own eyes. When I wrote that post almost a year-and-a-half ago I summed it all up with a lament about how that technology wasn't heading across the Atlantic any time soon. It turns out I was wrong about that, Gaggenau's Full Surface Induction will be available in North America in August of this year. 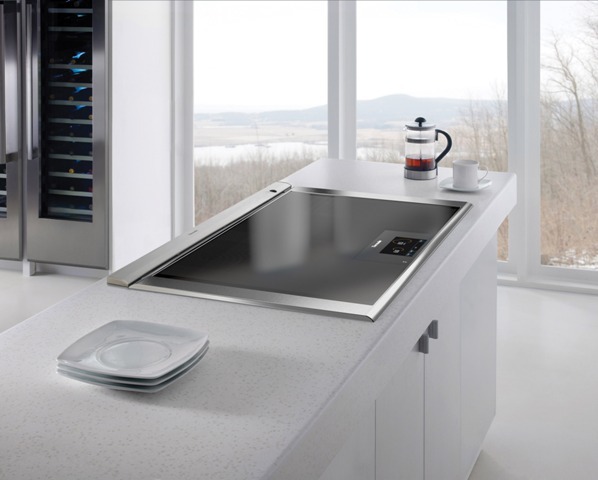 In the meantime, last January, my friend and colleague Susan Serra wrote a post about Thermador's new Freedom Induction cooktop. Thermador is a sister brand to Gaggenau and next month, the Thermador Freedom Induction will make its North American debut. When I was at Bosch/ Thermador/ Gaggenau's new facility in Irvine, CA last week I saw the prototype of this Thermador cooktop and I met the man who designed it. I admit it, I'm a geek when it comes to appliances, induction cooktops particularly. 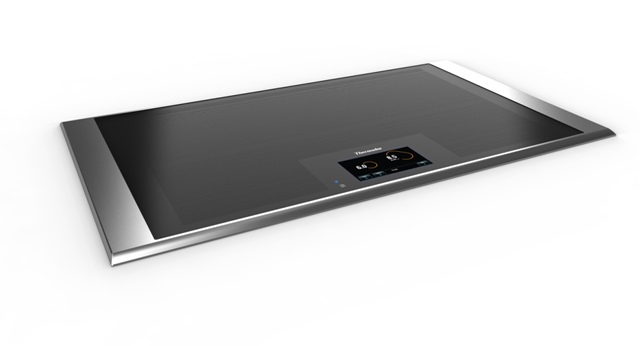 As amazing as Gaggenau's Full Surface Induction is, Thermador's Freedom Induction is even more so. Thermador's Freedom Induction has a 6.5" full-color screen that will teach you how to use the appliance essentially. Here's a video showing the man behind this innovation, Malte Peters, and an early version of this appliance. The cooktop he's describing has a clear glass surface, so that you can see the many, many induction coils that live underneath it. These smaller coils are how Freedom Induction works. All contemporary induction coils activate when they sense ferrous metal. Ordinarily, these coils are the size and shape of a conventional, round burner. Freedom Induction allows a user to place odd-sized pots and pans anywhere on its surface and it'll accommodate up to five pots at a time and a user can control each of those pots individually. What's more is that somebody can move a pot to another position and transfer the cooking settings to the new position. It's revolutionary and this video of the original Gaggenau Full Surface Induction explains how this technology works better than I can. Induction cooktops make so much sense I can barely stand it. They are significantly more efficient than any other cooking technology out there. They have the same level of control that gas does but without the radiant heat and wasted energy that accompanies gas. And unlike a traditional electric cooktop, the burners and cooking surface never get hot, so they're infinitely safer in homes with children or the elderly. So if you're on the fence about induction, buy yourself a set of All-Clad cookware and go for it. I have never met anyone who'd made the switch to induction who regretted it. There are a wide variety of models available from Bosch, Thermador and Gaggenau and if you have any questions about this technology, please shoot me an e-mail. I'm somewhat a zealot when it comes to this stuff and I'll answer all questions gladly. I was drooling and panting over the Gaggenau, and now that Thermador will be making one for sale in the states, I'm going to have to see it in person. Any word on the pricing? That cooktop retails for a hair under $5000. Today I'd knew your blog and I like so much. I´d like to invite you to visit it. I'm going to have to start saving my money to buy one of those beauties when I return to the US of A! You can but one in England already Sharon. Look into them.